It would be very great if you could see the compass and the map at the same time so that we do not have to switch between compass and map. This topic does not exist yet You've followed a link to a topic that doesn't exist yet. If permissions allow, you may create it by clicking on “Create this page”. I haven't known that this is already possible. Can you tell me what I have to do so that my screen looks like the screen on the picture? 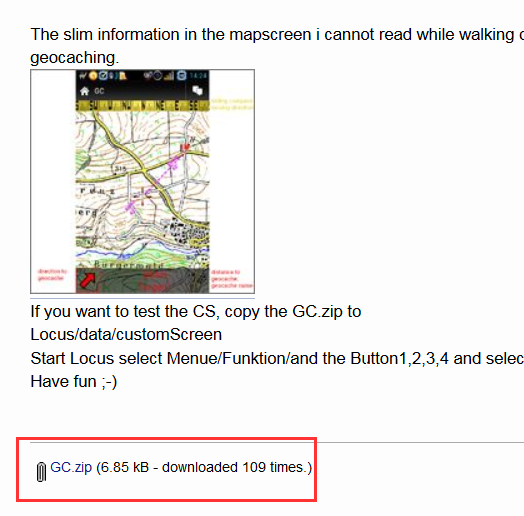 Thanks Michal, I got the zip-file from balloni55 directly. Many thanks to you both. at the bottom of the page I see this. And where is the link for the ZIP file?